MADISON, WIS.—WisconsinEye provides unfettered access to the actions of Wisconsin’s state government, broadcasting public policy debates and decision-making processes to viewers with a balanced presentation. Our studio facilities near Capitol Square are equipped for high-end live production, with broadcasts delivered to local cable TV systems and over the internet. We’ve been operating with the same broadcast and production infrastructure since we went on the air in 2007 and the system has recently shown signs of age. We needed a more reliable system to deliver 1080i HD content to our viewers so we hired Heartland Video Systems to upgrade our complement of 1080i cameras, production switchers, graphics systems and other related equipment. One of our primary goals was to use our existing fiber infrastructure to move content between the state capitol and our remote production studio two blocks away but in a far more simplified, reliable and flexible manner. We had long used a patchbay system to connect up to 72 camera positions—a mix of fixed and roaming cameras—across four floors of various committee, assembly, and Senate rooms. The Heartland Video Systems team recommended transitioning to a MultiDyne HD-3500 fiber-optic system to replace this setup. 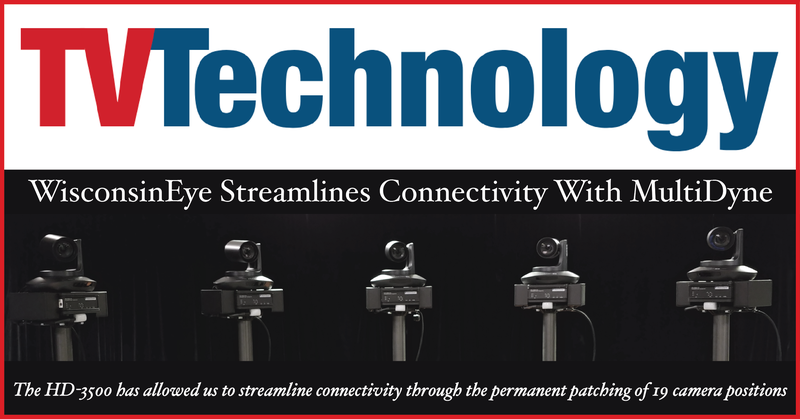 The move to MultiDyne has immediately streamlined connectivity through the permanent patching of 19 camera positions. This has reduced the time and labor required to patch and troubleshoot systems and eliminated the need to constantly plug and unplug the cameras. The system allows to very quickly bring up fixed and roaming cameras, adjust color and exposure, and reliably transport 1080i video, tally, RS-485 control, and other signals from the capitol to our studio. MultiDyne’s tally support has been a major added benefit, offering a clear indication as to which camera is on-air at any time. The HD-3500 architecture comprises a series of transmitters (capitol) and 24 rack mounted receivers (studio). The transmitters are highly adaptable from an integration standpoint and cleanly connect to our Ross PIVOTCam cameras and Vinten tripod base plates. Multidyne’s custom, bracket-mounted interfaces, and connectors are far more flexible and adaptable than the competitive systems we evaluated. The transmitters have also proven highly durable, an important benefit in production environments with roaming cameras. The black powder coat finish adds a sharp look and feel, making our camera systems look more professional. The MultiDyne system allows us to move signals over single-mode fiber to maximize transport distance and optimize bandwidth usage. The architecture is clean from a connectivity standpoint at the receive points, using splice cabinets and a fiber patch panel with LC connectors to support the cable runs at the studio. This also eliminated the need for a fiber router, which reduced overall project costs. The reliability of the MultiDyne system cannot be overstated. Signal drop-outs are non-existent, and signal integrity and quality is consistently robust. MultiDyne’s built-in monitoring capabilities are also clear and easy to understand. The LED interfaces on transmitting and receiving units display solid link lights as signals move over the fiber infrastructure. Similarly, blinking lights indicate the presence of RS-485 control and other data. There is never any uncertainty in regard to signal presence and connection quality. The team at Heartland Video Systems expertly specified and installed this customized system on behalf of WisconsinEye, with MultiDyne delivering exactly what we needed across reliability, flexibility, adaptability, signal integrity and ease of use. John Schroeder is the Director of Program Production at WisconsinEye. He can be reached at john.schroeder@wiseye.com. For more information visit multidyne.com or call 516-629-0381.